I'm back! My son and I got back around 10:00pm last night. We had a wonderful trip and now back to work. Today my mission is photographing a quilt. My son mowed a small patch in the back yard adjacent to my blackberries. We positioned 4 hay bales, blow-up mattress sheets, pillows and a quilt. (Plus extras for visual interest.) Barb has finished her Halloween quilt and I'm trying to get a cover shot for the pattern. How many photographs does it take to get it right? I've taken about 30 so far....and nothing says "wow" to me. So after checking the photographs for lighting and positioning I'm going back for more. Not only do I have to get the lighting right...the angle of the shot is very important too. How long does it take to set up an outdoor shot....longer than you might think. The set-up took about 1 1/2 hours. The actual photography is the quick part. Do you recognize the pumpkin? I hope she doesn't get heat stroke! Congratulations ladies! Send me your address and I will send you a pillow. Until later! I'm back out for more fun. I did recognize that pumpkin. Great photos. If only I would have stocked up on that black/cream alphabet sampler fabric. Yummy! Sheets are beautiful and I recognized the Pumpkin right away! So much fun! 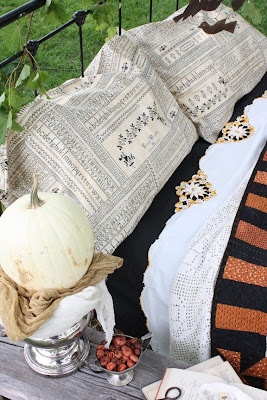 I love the sheet..the crochet edge is so pretty...I think "pumpkin" is enjoying all his picture apperances. I recognized the pumpkin. She needs a name!!! Love the photo and my mom used to do that on sheets. She did embroidery work on them too. I'm crazy about those pillows!!! So that's the secret -- you're a perfectionist. :D No wonder your pictures always look so great! I love that sheet, love Miss Pumpkin, and the little bit of the quilt we can see. Can't wait to see the whole thing! You do a fabulous job of styling your photo shoots. I can't wait to see what you have cooked up.....it looks scrumptious! Alam, I see the pumpkin has made an appearance in your photo!!! Love what I see of the quilt. Yes, the sheet with the crocheted edge is lovely but i love the colors in the quilt and your pic, as always, is gorgeous! Miss Pumpkin head is gorgeous! I am a winner of one of your pillows. Thank you!!! I could not find your email to send you my mailing info so could you email me at Noodles3sk@neo.rr.com and I will send my info. The whole thing is fabulous! I really love the colors in the quilt and the sheet...your artistic talent is greatly appreciated by all! I wanted to show you my pincushion “Souvenir de France” and thank you so much for the chart...it is beautiful! I hope that you AND the pumpkin avoid heatstroke! LoL! OH!!!! Covet, covet, covet. After a thorough search and 2.5 yd score from a shop way out west, I am convinced there is not another scrap of that sampler fabric available. That wonderful pumpkin needs a name. Can't wait to see the quilt. Edie in hot, hot, hot, windy, windy, windy Harlingen, Texas where the poor pumpkin would be fried! Love the pillows and the sheet! Glad to see Miss Pumpkin again! I recognized Ms Pumpkin right away. She fits in perfectly. Speaking of perfect, I know that you will find the perfect picture; you always do because you are so patient to wait for it to happen and so meticulous about staging the picture. What a lovely picture! That filet crocheted sheet is just gorgeous...I love vintage linens and just started collecting them this year! 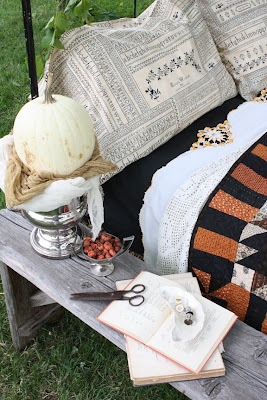 The quilt is fabulous looking and that tease of those colors are making me yearn for some fall stitching, lol. Be sure to bring Ms. Pumpkin back in soon or she may turn into a pumpkin pie!!! Can't wait to see that Halloween quilt....sounds like I'm not the only one looking for the cream/black sampler fabric. Used the last bit of mine on the 'Trick or Treat' quilt. Can we request another printing of the fabric from Moda? I never know which I enjoy more, your quilts or looking at your decorating. That's why your blog is such a gift! I have been searching high and low for a place to buy a copy of "Small Favorites for All Seasons" and I can't find one anywhere. I keep going back to your post featuring some of those gems from that book, and I want to make a few of them for my family. I thought that I had all of your books, but not this one. Any ideas of where I can find it? Please, can you give us just a tiny hint for the Halloween stockings? I've already placed my order, but will be on vacation when it comes in to the shop...so I'll have to WAIT to pick it up! AAUUGGH! Hi Alma, your photo of your quilt is going to look great. You can tell just by the little bit you are showing. Now the pumpkin might become pumpkin pie if you don't get it in. Hi! thanks for the pictures. Cannot wait to see this quilt. I never can remember which one is which when I think of Barb and Alma's pictures in the books I have.Could you post a picture of you, Alma? It can be any age, I'll recognize you! Congrats to the winners. Please don't tell me this is the same pumpkin from last year?? How can this be? 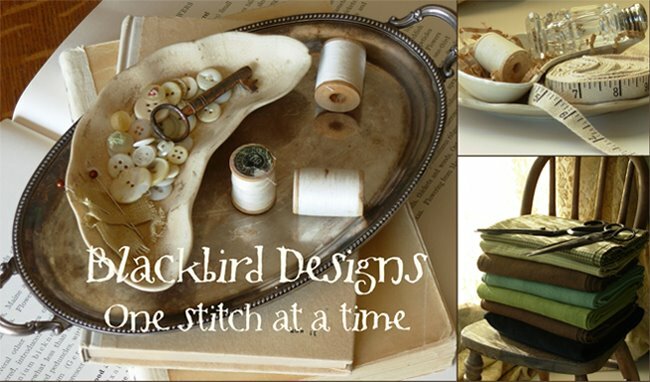 Ok, so how about the cream/blk sampler fabric? Any info on reprinting and/or finding this fabric? My sister and I have Sisters' Week where we get together and quilt and giggle and all those lovely things Sisters do. We are scheduled for early September - I hope the Halloween quilt is available in time for our get together! It is wonderful!!! !